Ausdag - that chanter looks to be of a shorter length to me than the norm for concert D. The back D hole looks closer to the reedseat than I would expect. Did you base it on another maker's model or is it your own bore design? 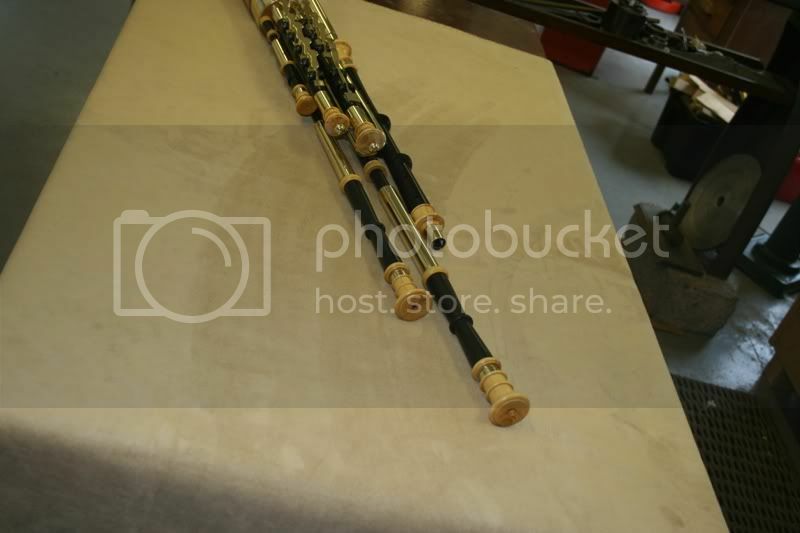 It's the angle that the chanter is photographed at - a bit deceptive. In reality, the entire thing is slightly longer overall in terms of length and tone hole spacing than you typical 'Rowsome' D. It's the same design as the four chanters in my recent comparison video on U-tube I posted here a few months back. After more than 25 years of playing a flat set I started contemplating going where I thought I'd never go. A set to go out and play. Reluctantly I looked around for anything that would suit until an offer was made I couldn't resist. 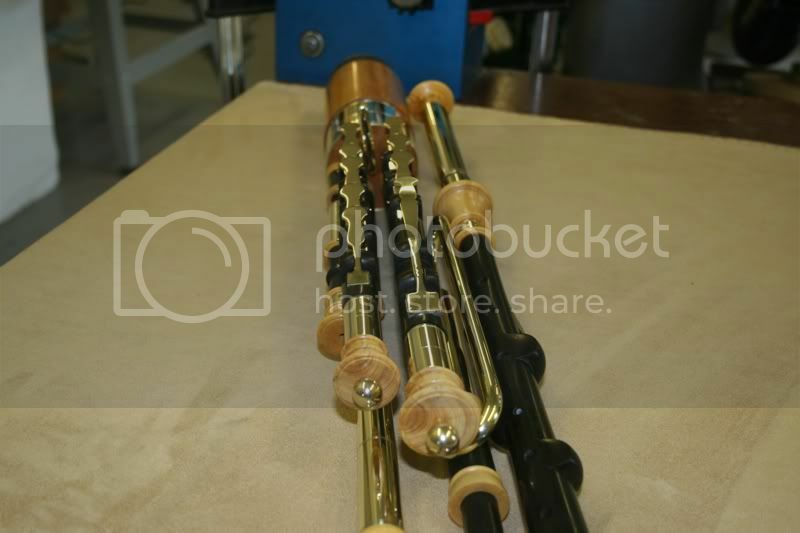 So last Friday I hopped on a plane from Shannon, with my son and an empty pipescase to collect a newly finished set of pipes. The brief was for a compact, sturdy yet elegant 3/4 set with a strong voice that doesn't scream at you and the tonal flexibility of a flat set. The set ticks all the boxes. Very nice, who made the set? Looks like a Ray Sloan set, but could be wrong. "I'll dance with the gypsy"
Its a Geoff wooff narrow bore D? Am I right mr gumby? Last edited by Draighean on Thu Jun 21, 2012 7:42 am, edited 3 times in total. Is that a straight bass drone? the plod wrote: Is that a straight bass drone? 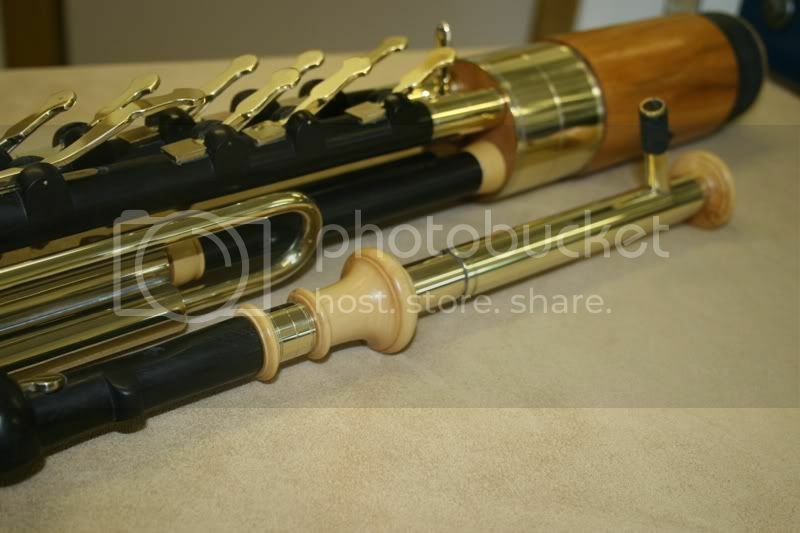 No, it has a loop in it that is somewhat hidden by the baritone regulator. It is a C natural flat set so the drones and regs are a little longer. OK, I see it now. cool. beautiful work as always David, who is getting them?